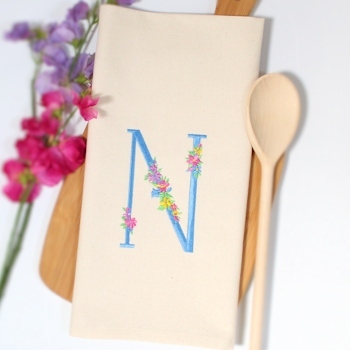 Beautiful personalised gift tea towel that is monogrammed with a large initial with climbing flowers and colourful floral spray bunches to each side. Bespoke embroidered tea towel featuring a large initial and beautiful flowers and little butterflies surround. The Initial is sewn in a thread colour of your choice. 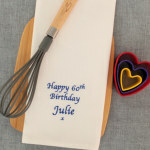 This tea towel makes a pretty gift idea for birthdays, anniversaries or Mothers Day! Enter a single letter and thread colour you would like personalised. Amys Gifts will custom make this gift to order and dispatch within 48 hours.